This year the United Nations has called on “everyone to stand up for someone’s rights.” While a laudable directive, this call to arms should include discussion of the implications. If we are to call on individuals to stand up for Human Rights, we must acknowledge the serious consequences that often accompany these acts of courage and empower those who are brave enough to take such risks. Technology can help maximise individual efforts. Yet by the same token important security considerations that go hand-in-hand with the use of such tools must remain central to all our discussions. Particularly in the post-Snowden era, protecting documenters means considering both offline and online security. A call to arms without recognition of this vital point is at best misguided and at worst risks causing more harm than good. In 2010, before the Snowden revelations, a video emerged of alleged Sri Lankan troops executing Tamil prisoners. Dr Mark Ellis, Executive Director of the International Bar Association, was asked to comment on its authenticity and value to a court of law. He found that despite the heinous crimes depicted, the harrowing footage was likely to be of no use to a court of law. That realisation sparked the following thought. What if there was a tool that could address this enigma of a 2.0 world, where countless images and videos evidence international crimes and yet provide no evidence at all? 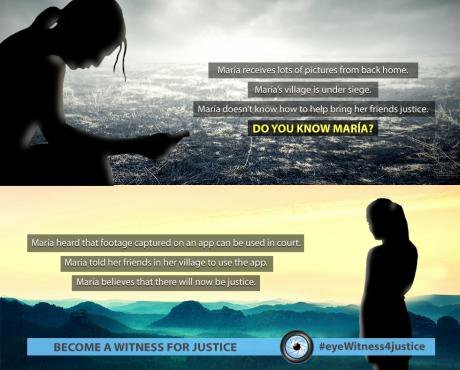 Following four years of research, development and testing, the eyeWitness to Atrocities app, funded and initiated by the International Bar Association, has been launched to provide a solution that could allow human rights defenders, activists and other courageous citizens to collect verifiable evidence for use by international courts and investigations. The eyeWitness app is a mobile camera app, for Android devices, that allows the user to record photos, videos, and audio in a manner that facilitates the use of the images in court. The security implications of such a tool remained central to the app’s design and development. A rights-based approach to technology was adopted in a now post-Snowden era, to prevent those already risking their lives from doing so more dangerously. Working in close consultation with various legal bodies, eyeWitness developers had to consider the needs of both the app user and the legal entity that may require certain conditions to be met if footage was ever to become real evidence. Taking into account the need for various kinds of information to accompany footage, the primary design decision in this regard was to allow the user to still remain anonymous if they wished. Anonymity whilst not a right in practice, facilitates the protection of many rights such as the Right to Freedom of Expression, Freedom of Information and Freedom of Association, especially when it comes to groups such as human rights defenders, activists, journalists or other perceived dissidents. Security features that help safeguard anonymity therefore function as indirect protectors of these rights, as without them the promotion and protection of these rights would be challenged significantly. Another key feature embedded in the eyeWitness app’s design is a trusted chain of custody. For legal professionals wanting to pursue accountability for these crimes, the chain provides validity that the footage being used as evidence is an original copy that has not been tampered with since the moment of capture; key to promoting the admissibility of such evidence in court. As a result, all footage sent to eyeWitness’s secure repository has to be stored offline with all access monitored and logged. The European location of eyeWitness servers are also undisclosed, for safety and security reasons that can still come under threat despite the continent at large holding liberal democratic values. For the human rights defenders, journalists or simply courageous citizens seeking to raise awareness, the trusted chain of custody helps authenticate their claims and gives the footage captured legitimacy. The eyeWitness app records much needed meta-data, such as cell phone tower IDs, GPS coordinates and nearby WiFi networks, the time, date and location allowing the footage to be verified. The chain also gives an assurance of who will access captured evidence and by what means the footage will be used. Evidence collected, as a result, goes from being “alleged,” to holding some truth in the wider world and its justice systems, but without jeopardising the safety of the app. Yet for many, particularly the perpetrators of the worst international crimes, the idea that their actions can be reliably recorded does not sit so well. The security risks associated with documenting the worst international crimes are unavoidable, but mitigating the risks to protect witnesses was and is not. Here is where an understanding of technology and what it can and can’t do is key, as it is only with this knowledge that we can begin to recognise the importance of design. For eyeWitness, this meant deciding to never record IP addresses or other data that may identify its users, and ensuring the information recorded, stored, and transmitted using the app is encrypted and hidden from view. By doing so, eyeWitness has been able to create a unique model that protects the witness to a crime like never before. The decision to protect anonymity as best as possible also ensured that if ever pressed by the Defence or Prosecution to reveal the data held, these parties would also be unable to trace back submissions to the source. The right to anonymity, whilst always promoted by accountability mechanisms has never allowed witnesses to give evidence without ever having to identify themselves to some sort of authority. The security features were a deliberate choice in eyeWitness’s design. Although risks can never be totally eliminated, as no technology is perfect, the importance of focusing on addressing security concerns first remains central to the rights-based approach. As another part of this approach, eyeWitness also worked closely with documenters and other investigative bodies when testing the app, maintaining ongoing relationships with these groups to promote the app’s incorporation into existing workflows. Making the technology free was the final guarantee of these principles. Individuals who document grave crimes do so at great personal risk. By definition, they are prioritizing justice and lessening the suffering of others over their own wellbeing. However, their efforts for the greater good should not mean that they forfeit their own rights. It is incumbent upon those of us working to empower these courageous individuals with new tools and approaches to do so mindfully, in a manner that not only considers their rights, but also protects them to the furthest extent possible. Instead of calling upon people to simply stand up for somebody’s rights, let us ensure we are responsibly equipping them to do so.